Did you know we have an open invitation to write a guest post? Well we do! 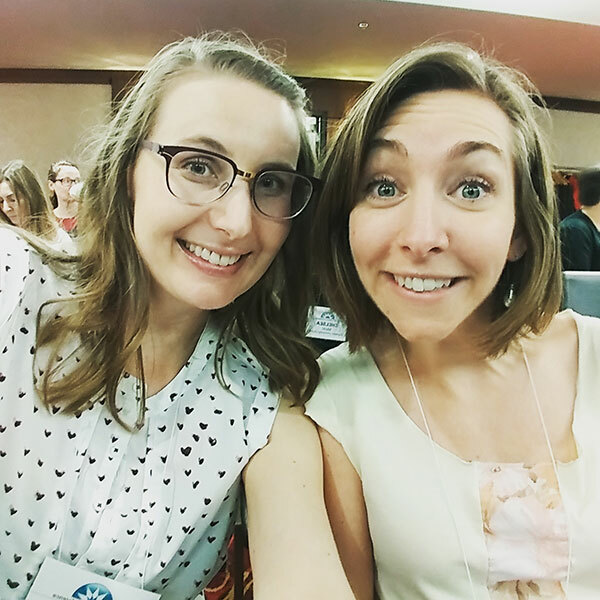 Today I am delighted to feature a guest post by Katherine Hickey, a Children’s Librarian with the Metropolitan Library System in Oklahoma City. She also wrote about Art Making for Earliest Learners awhile back and folks, let me tell you, she needs a blog of her own! Now she’s here to teach us how to use mirrors (squee!) in storytime. Take it away, Katherine! Mirrors are often present in early childhood play areas as they help support important developmental milestones. French psychiatrist Jacques Lacan even named an entire developmental stage associated with the use of mirrors, called “the Mirror Stage.” In this stage, infants and toddlers learn to recognize their reflection which is a crucial step to later being able to identify themselves as “I.” Even though the Mirror Stage has been replaced and renamed in other more popular Child Development theories, reflection and recognition remain essential. 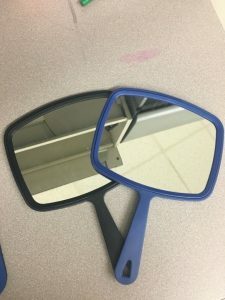 My library has handheld mirrors for children to play with during our playtimes which are always wildly popular. 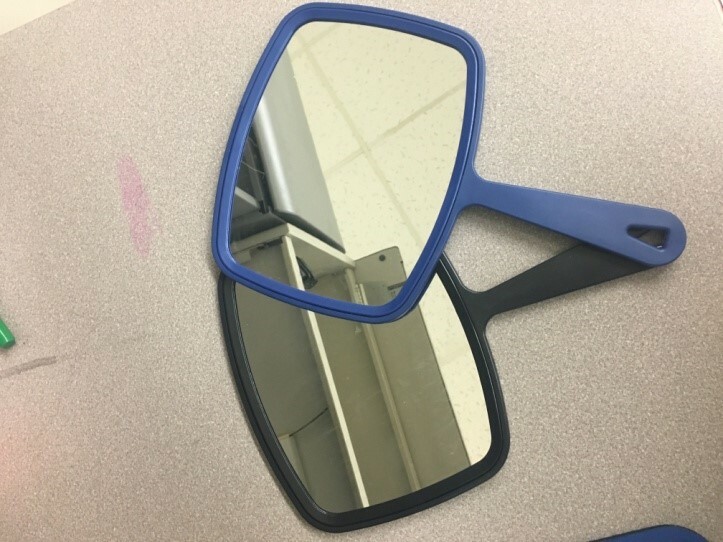 This got me ruminating on ways to use them during storytime to build early literacy skills, and so I bought a box of 24 mirrors and did some experimentation. They have been a fun alternative to the traditional props like bells and scarves, and I’m excited to share what I’ve learned so far! All of these activities can be modified for a baby, toddler, or preschool audience. Hand the mirrors to the caregivers, not the child, for safety reasons. The caregiver can then decide if they want to hold it or allow their child to hold it. Clearly communicate the “ground rules:” if a mirror gets broken bring it to the librarian and we will hand you another one, be gentle with your mirror, when you are not using the mirror, keep it next to you. Decide when you are going to gather up the mirrors (at the end of the program, at the end of the activity, etc.) and communicate this to the group so that the children can anticipate when they will have to hand them back. Children begin to develop self awareness (e.g. recognizing self in a mirror) between 15 and 24 months. Having your child grip the mirror will help them strengthen their motor skills and hands. This is important for them to learn how to hold a book and turn a page, and later learn how to write. Exploration before storytime. Handing out mirrors to children as they enter the storytime space gives them something to explore and fidget with while waiting for the program to begin. Learning facial features. Have the grownup hold the mirror up to their child’s face and point to their facial features while singing songs like “This is the Way we Wash our Face,” “Eye Winker,” or “Here Are My Knees.” This helps reinforce vocabulary. Looking at clouds. Take the group outside and have them set the mirrors on the ground and look at the reflection of the sky. Looking at scarves. Put the mirror on the ground and have the child float a scarf above it to see its reflection. Mirrors to see behind you. Have the caregiver hold up the mirror above the child’s head, slightly tilted forward. The child should be able to look in the mirror and see what’s behind them. You can use this as a prompt to learn directional words, like “in front of” “behind” “to the side,” etc. Counting. Hand every other caregiver some kind of plastic toy (a ball, a block, in this case, a little frog). 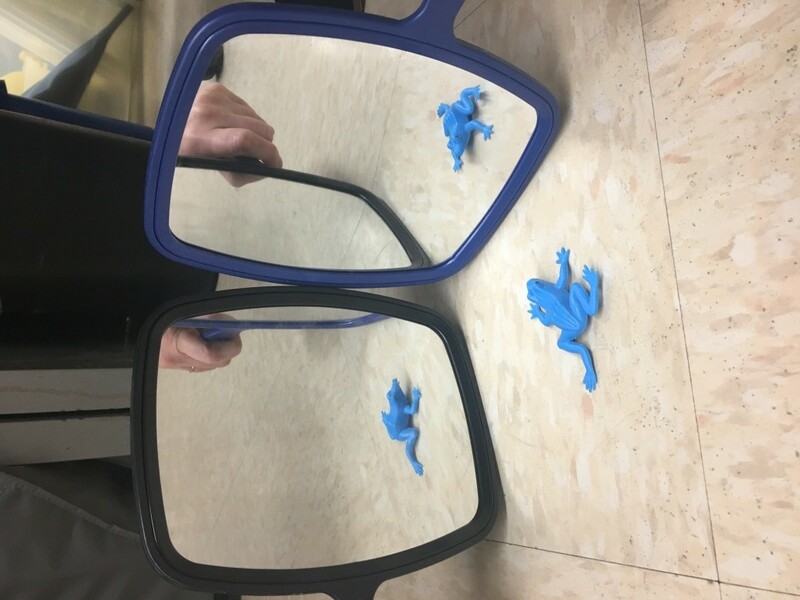 Have two caregivers pair up and put their mirrors together, with the toy on the ground. Have the children count how many frogs their see. Eye Color: Brown, Blue, Green, and Other Hues by Jennifer Boothroyd. Talk about different eye color and have the children try to identify their own eye color by looking in the mirror. Find a Face by Francois Robert. This simple book is all about finding faces in every day objects. There are few words on each page so it’s great for a baby or toddler audience. Fiona’s Feelings by Dr. John Hutton. Caregivers can hold the mirror up to their baby’s face and try to replicate Fiona’s facial expressions. This is also a great prompt to talk about feelings! What I Like About Me! By Allia Zobel Nolan and Miki Sakamoto. Each page of the book celebrates a body part. Have the children point to the corresponding body part while looking in the mirror as you read. This rhyming book is a little text-heavy for babies and toddlers so I usually just read a few of the words on each page. You can also have the child look at themselves in the mirror and say what they like about themselves. 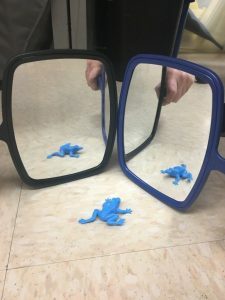 I’ve just started scratching the surface of all of the early literacy activities that can be done with mirrors, so please feel free to comment with your own ideas! Courage, M., Edison, S., & Howe, M. (2004). Variability in the early development of visual self-recognition. Infant Behavior and Development, 27(4), 509-532. Julius, M., Meir, R., Schechter-Nissim, Z., & Adi-Japha, E. (2016). Children’s ability to learn a motor skill is related to handwriting and reading proficiency. Learning and Individual Differences, 51, 265-272. Well hello there, everyone! How is your summer going? If you’re like me then your eye is already on fall storytime planning. I thought I’d do a few posts highlighting the new videos we’ve released on YouTube over the past year. Did you know we still upload new videos? We do! And now I will organize those videos into nice thematic posts for your storytime planning. This week I’m sharing songs and rhymes you can use with props such as shakers, rhythm sticks, scarves, parachutes, etc. These are some of our most requested videos. Here are my new favourites with information on how I use each. Shout out to anyone who has a super large storytime and can never use props because you don’t have enough of each for every kid! I got you. This song is perfect because you can pass out ALL the props you have and sing a verse for each type. Plus the tune is familiar and families join along pretty quickly. Just rotate the name of the prop for each verse. A bonus two songs in one video! Here are some options for how to pass out and collect props. With bigger groups, I just keep singing it over and over again until we’ve got them all. It can really help the little ones give back the prop. If you’ve got a kid who really doesn’t want to part with their prop, I avoid the drama and just get it from them after storytime. Put them away for another day. I love using this one with preschool and school-age kids. It’s challenging for them to tap at the right moment and when they do it’s rewarding. Tapping the sticks adds an extra awareness of rhythm. A great way to add a twist to a classic tune. This is a simplified version of The Three Billy Goats Gruff. It works best with school-age kids, though you could totally get preschoolers on board if you repeated it every week for an entire storytime session. Sing it really slowly to start. It’s great for kids to hear the same story in different formats. Pair this with a felt version or book version to reinforce the story elements. Trip, trap, trip, trap – troll goes in the moat! My absolute new favourite rhythm sticks song! It’s fun, imaginative, and easy to learn. Perfect for even toddlers. If you only try one song on this list, make it this one. We have some talented friends, ya’ll. This one was written by Brytani Fraser and then remixed by Emily Lloyd. We love them so much! Here’s us doing our version. Great for shakers and scarves. down by the wavy ocean. and he waits…and he waits…and he waits. The laundry shakes, shakes, shakes until it’s clean. Lift the lid and what have you got? That’s what I’ve been digging lately. How about you? Let me know your recent favourite songs and rhymes to use with props in the comments. Remember when I put a call out for guest posts? Well, I’m so excited to share the first one we received! 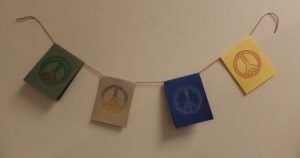 This post is all about how one library makes a special effort to celebrate Día. The post is written by Kelly Doolittle. Kelly is a Library Assistant in the Youth Services department at the Tompkins County Library. She started out working as a page in 2001, graduated to a circulation clerk, and then technical services, and when the job post for Library Assistant in Youth Services opened up, she went for it! Thankfully, she also got hired! She’s been working with children and their families since 2009 and loving it. For the past few years I have been participating in the celebration of Día during our special end of session library storytimes. We’ve received so many heartfelt thanks and positive reviews from patrons that I thought it might be fun to share some ideas and outlines with other storytimers! 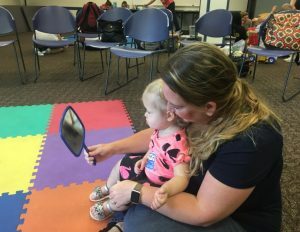 They are interesting to put together, and collaborating with colleagues and volunteers in the community is such a wonderful aspect of doing Día storytimes as well! While we try to incorporate multiculturalism into our regular storytimes as much as we can, there’s something so special and fun about creating storytimes that are all about celebrating diversity through books with children! When you throw in songs, movements, (and especially puppets!) these storytimes really come alive. Many years ago, we bought a mobile puppet theater. It was one of the best purchases we could have made! 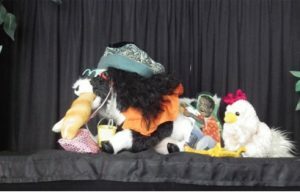 The first puppet show we ever did was staged in honor of the donor. It was called The Barking Mouse, which is a fabulous option for Día as it is based on an old Cuban folktale. Cow Says “Moo!” by Ellen Weinstein. Here is my list of favorite book-to-puppet theater books. 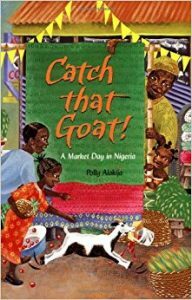 Hornbook Guide Review: “Ayoka chases her runaway goat through a crowded, colorful African marketplace. great illustrations of the Nigerian characters and the wonderful market place. 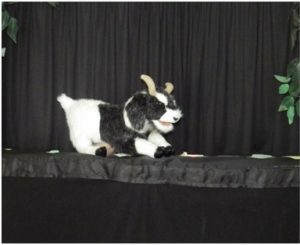 As I was reading each two-page spread, behind the theater a colleague attached the missing market item/prop to the goat puppet being wielded by our awesome volunteer, which was then pranced across the stage and off again until the next two-page spread on which the next missing item was realized. 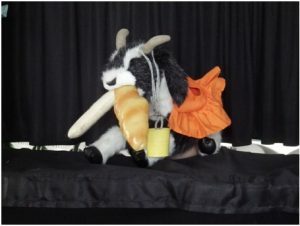 By the end of the book, the goat was covered with all the missing items. Plus the audience got a tour of a Nigerian market place through Alakija’s colorful illustrations! For Catch That Goat order of accessories click here. My colleague and I had so much fun with this one!! That is half the fun, dreaming up props that will make these books work with puppets and our little theater. cartoons of the food types on them. It’s hard to describe here, but it was adorable & the locals LOVED it. Here is a sample outline from our last Día celebration storytime in April 2017. I hope this post helps to generate some new and fun ideas for Día storytimes! I’d also love to read about your own Día celebrations! Please feel free to ask questions and leave comments. Here’s to celebrating Día together next year! For our latest Día storytimes, please check out our blog. We’ve heard about these things called rhythm sticks, we’ve read many a blog post but for way too long they remained a mystery to us. Lindsey finally put her foot down and bought some. We’ve done shakers, we braved scarves and darn it it was high time we mastered the sticks! The result? We had a blast filming a whole bunch of new songs! We had so much fun we declared November #RhythmSticksMonth and you can find them all here on this playlist. To get us started we turned to the wonderful wide web of our colleagues for ideas and strategies. Storytime Steph has a fantastic post on Using Instruments in Storytime which features some great songs to get started and a link to make your own rhythm sticks. 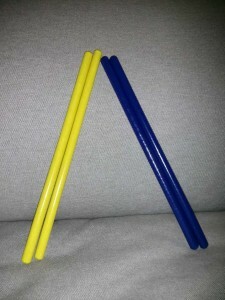 That link takes you to Amy’s Laptime and Storytime blog where she provides simple instructions on how to make your own rhythm sticks, an activity to get the kids practicing responsible rhythm, lots of songs and even books with rhythm. Whew, what a post! Next up is Anne’s Library Life, where she dedicates the activity section of her babytime to rhythm sticks and includes some great parent-talk and early literacy tips on how to use them and why they’re important. 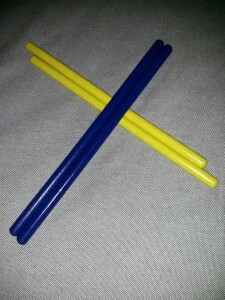 Kathy and Christine at Storytime Stuff share some brilliant ways to use rhythm sticks which go beyond the ordinary and would work for school age kids as well. Using them as wands, turning them into spiders, flutes or clock hands? Pure genius! Finally, Claudia at Never Shushed has put together a magical storytime all about snow (Winter Hokey Pokey!) as well as one on rhythm and sound which on top of some neat new songs has lots of ideas for using rhythm sticks. Don’t Be Shy: Using Puppets in Storytime! We recently attended a Puppetry Workshop with one of our most beloved instructors from our MLIS, Allison Taylor McBryde, and what a lovely evening it was! Both Lindsey and I have been looking to dust off our puppets and use them in new and different ways and Allison’s workshop was just what we needed. I thought I’d use this opportunity to share some of her puppet whispering ways, point out some of our favourite puppet songs, rhymes and resources, and see if anyone else has other puppety things to add. Puppets can be used to break down barriers between us and parents/kids, especially when working with vulnerable families. Whereas we can be viewed as a stranger, puppets are inviting and friendly. Always use a story you love, a story you have heard many times and enjoy hearing again. Then find puppets to fit the story. When creating a voice for the puppet it’s not necessary to change your voice dramatically – you won’t be able to sustain and remember it in the long term. Try just going a shade softer or louder or grumpier. The puppet will draw their attention, not necessarily your voice. When using an animal puppet really think about the animal – a turtle will speak slow while a wide mouthed frog will be loud and boisterous. Watch video clips of the animals on YouTube and observe the way they move. Try using puppets with rhymes and poems. “Cheat” by having the puppet read the poem right from the book. You are modeling reading and making it easier on yourself. Have a “poet puppet” that reads a poem at the beginning of every storytime or seek out poems with dialogue so the poem becomes a conversation between you and the puppet. 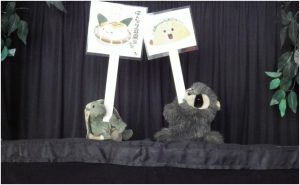 A couple unusual ways to use puppets in storytime: as cues or guides, like Sleeping Bunnies by showing them with the puppet what you’d like them to do. Or use puppets for readers’ advisory by interviewing a puppet from a story or having them share their favourite book! Last spring my colleague, Tess Prendergast, let me borrow her collection of storytime scarves to use with my preschool storytime group. They were such a hit that I knew I wanted to film some scarf songs for Jbrary. The great thing about scarves is that you can use them with any age – babies, toddlers, preschoolers, even school age kids. If you’ve never tried using scarves with kids before, these videos are a great introduction. You can also follow our scarf playlist or Pinterest board to see new videos as we make them. We learned this song from Anna at Future Librarian Superhero. The kids absolutely love throwing their scarves in the air, so I’m always looking for songs that incorporate this movement. Dana learned this song at a Mother Goose training, and I think it’s the perfect combination of a classic tune and a variety of actions (throwing, shaking, waving). Give Your Storytime a Shake! We are happy to report that we’ve come out of it now, but Lindsey and I went through a mean shaker phase back in December. We appreciated your support and kind words and because we lived to tell our tale we’d love to share a few things we learned along the way! A few quick links if you’re a busy beaver we suggest you check out our Egg Shaker Songs playlist and Egg Shaker Songs Pinterest board. If you’re not a busy beaver and feel like sticking around give Lisa’s Shake Shake Shake post a read. She not only shares song ideas, but explains why you should use shakers, which ones and even better…how! Coming to us from Scotland Library Quine has also shared a great list of shaker songs and activities. 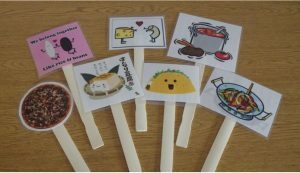 Finally we love this post from the Massillon Public Library Children’s Department blog which has some delicious food themed songs and tips on how to make your own shakers. Ok we think that’s quite enough reading for now, here are some of our favourite shaker songs! 1. If You’re Happy and You Know It, Give a Shake! This is a classic and for that reason it’s a great song to warm up with and let your storytimers get used to shaking their shakers.